MUSKOKA – Lost in the chaos of the week’s Ontario’s Charter chaos is any mention of the lost opportunity for Muskoka land owners to vote for their district chair. 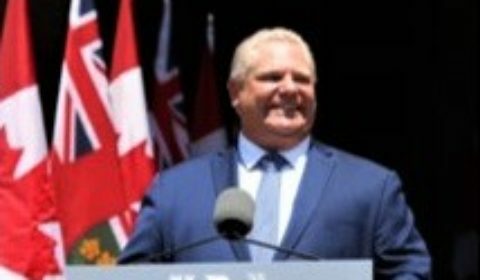 Doug Ford’s use of the notwithstanding clause pretty much left out all mention of the voting for regional chairs in Muskoka, Peel, York and Niagara. And so, while MPP Norm Miller was again voting Thursday with Bala’s least favourite premier, there was no new mention of the people in York, Peel, Niagara and Muskoka finally getting to choose their top tier municipal politician. Premier Doug Ford put the kibosh on the former Liberal government plan in late July just three two months out from that anticipated municipal election, Oct. 22. The introduction of the Efficient Local Government Act, while it may include a brief sentence about examining the structure of regional government (as did its predecessor that was shot down last week in court), still leaves local voters with an “appointed” system open to the kind of back-room dealing the former Liberal government set out to end. While the three regions affected (Muskoka is a unique District in Ontario), opposed the public vote, locally, chair John Klinck who has never been open to the idea, called the cancellation “questionable” in an interview with the Globe and Mail in late July. The 21 town and township councilors elected to the District of Muskoka will still elect the chair at their first meeting. Current chair John Klinck, past chair Gord Adams, and former chair Hugh Mckenzie are running this time. Municipal Affairs Minister Steve Clark said in that Globe story that “a review of regional government, generally” was to be included to new legislation, which despite vociferous opposition is destined to pass before month’s end. Meanwhile, while the district councillors — who virtually have little say in governing Muskoka at the town or district level — will have a powerful voice in selecting “the man” who does wield the power with his enabling staff. So, if voters want to have a say in the vote for district chair, they should ask their candidates which of the three Muskokateers they will vote for.